On May 8, 2010, “Mr. Cub™” Ernie Banks and his wife Liz Banks, who is president/founder of The 500 Home Run Club®, LLC, were special guests at The Volunteer Center’s Golden Gala as the non-profit organization celebrated its achievements over the past 50 years as the first Volunteer Center in the state of Illinois. In introducing Mr. and Mrs. Banks, the event emcee paralleled the dynamic couple’s longtime positive influence on both “America’s Pastime” and their service to the nation’s underprivileged youth and seniors with the Volunteer Center’s 50-year (and counting) mission of helping residents and service groups in northeast suburban Cook County volunteer or engage in days of service and service learning programs with over 200 non-profit organizations. 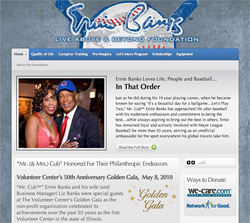 The Banks were applauded for establishing the Ernie Banks Live Above and Beyond Foundation™, a 501c3 foundation that has been helping underprivileged children and seniors to improve and develop their capabilities since 1998. The charitable foundation raises funds to support many programs that promote social welfare by contributing to a wide variety of programs that enhance neighborhoods, eliminate prejudice and relieve discrimination among various age groups and races. Congratulation Ernie and Liz, and keep up the great work! Quality of Life Seminars for economically challenged individuals and their families. And while you’re there, please consider making a donation that will be used to help those in need by clicking on the we-care.com or Network for Good links located in the Ways To Donate section.